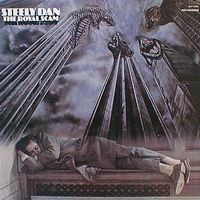 There is a marked change in Steely Dan's music for the album The Royal Scam. As some reviews written at that time also noted, Steely Dan move away from the generally laidback, cool attitude that their music conveys a bit and rock out. Aja should have been the logical next step after Katy Lied as songs like Doctor Wu already hinted at the direction they would take on that album. Instead, Steely Dan put together what they took to be a blend of rock and funk and which instead ended up sounding like - at least to my ears - jazz rock/fusion with vocals. This aspect is particularly noticeable on Green Earrings. The intro sounds like it would build up to some funk but once their trademark guitar chords kick in, we are clearly in fusion territory. The song has two guitar solos back to back in the middle and another in the coda. Did they really expect to succeed with this? Apparently, they did. As Finnforest mentions in his review, Donald Fagen and Walter Becker, the twin kingpins of Steely Dan, felt that they desperately needed to get their act together or they would get relegated forever to the 'second division' of the music business. This urgency is brought out in their sleeve notes (do read it, by the way, it has a hilarious account of Fagen and Becker sharing the same nightmare). Some of this urgency seems to have to rubbed off on their music. The somewhat meandering nature of Katy Lied is gone and in its place is a very tight, driving execution of the Steely Dan formula. The elements remain fundamentally the same: a blend of jazz, funk, rock and blues with Fagen's sly style of singing on top, performed and produced to perfection. But slow burners like Caves of Altamira are now interludes that provide breathing space in the midst of racy music rather than the norm (as in Katy Lied). There is further a hint of tension that balances out their usually complacent irony so that, at least until you get to the somewhat repetitive title track, the album seems to fly past in a hurry. Clocking at 41 minutes, it is, like most Steely Dan albums, indeed not too taxing on your time. The music also complements the lyrical themes used in this album (or, the other way round, if you like). Don't Take Me Alive or Kid Charlemagne focus on criminal activity while Everything You Did focuses on infidelity. The common feature is somebody has done some wrong and it's either him trying to run or the hunter in hot pursuit. The escapades are laced with trademark Steely Dan humour (for instance, "I jumped out of my easy chair/It was not my own"). You've really got to listen to that and the album as such with Fagen's wry delivery; it adds to the fun. So is there a problem? Apparently not, if you ask Fagen and Becker. To quote from the sleeve notes: "we find ourselves rocking out to the soul stirring sounds of some fiercely funkadelic and deeply righteous Bernard Purdie grooves, Chuck Rainey bass lines, Paul Griffin piano riffs, and the like. Here comes a guitar solo - Larry Carlton, no problem there." As these words attest, there is indeed some amazing musicianship on this album. You will be simply spoilt by the abundance of great guitar leads (check out THAT tone on Don't Take Me Alive or Everything You Did for that matter) and there is also a wonderful saxophone solo on Caves of Altamira. As I mentioned earlier, the title track stretches on for a bit but otherwise, the album is mostly a very engaging affair. But it did not ultimately deliver what they were looking for in terms of success. The difference between previous Steely Dan albums and Royal Scam is subtle rather than stark. By 1976, they weren't exactly alone in the corporate rock game either and it may have been felt that they didn't really have a new sound to offer with this album. As a result, it was reasonably successful but not the blockbuster they wanted. Steely Dan raised their game on Royal Scam but the public weren't really listening. That would be the next album, Aja. But circa 2013, Royal Scam has much to offer for fans of jazz rock/fusion, as long as you don't mind it being fitted into a mainstream pop/rock format. 5 stars.